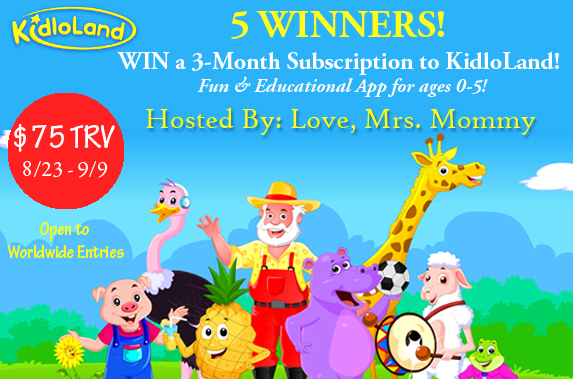 Love, Mrs. Mommy: KidloLand 3-Month Subscription Giveaway! *5 Winners* ($75 TRV)! KidloLand 3-Month Subscription Giveaway! *5 Winners* ($75 TRV)! KidloLand has everything from Nursery Rhymes and songs, to educational games and more! They have fun characters that dance, sing and move about throughout the song or activity your child is viewing. Right now KidloLand has over 300 rhymes and educational songs! You will find all the popular age-old nursery rhymes like Mary Had a Little Lamb, all paired with fresh, fun characters. This app not only has fun songs and lullabies, but it also teaches your child about fruit, the alphabet, vehicles, colors, shapes and so much more! Click here to read Love, Mrs. Mommy's full review! Disclosure: Love, Mrs. Mommy and all participating bloggers are not held responsible for sponsors who do not fulfill their prize obligations. Love, Mrs. Mommy received a year subscription to KidloLand at no cost to facilitate the above-mentioned review. This giveaway is in no way endorsed or sponsored by Facebook or any other social media site. The winners will be randomly drawn by Giveaway Tools and will be notified by email. Winners have 48 hours to reply before a replacement winner will be drawn. If you would like to participate in an event like this please contact LoveMrsMommy (at) gmail (dot) com.